After Lent and Eastertide, today we resume the celebration of Sundays in Ordinary Time and, with it, the progressive reading of the gospel according to Luke. Today’s gospel is about a centurion, that is a Roman military officer, a pagan, but benevolent toward the Jewish people. Usually, Jesus did not care about pagans; once he said: “I was sent only to the lost sheep of the house of Israel” (Mt 15:24). But, more than once, he was forced to intervene in their favor, won by their faith. In this way Jesus, against his very words, shows us that he has come for the salvation of all mankind. In the centurion’s attitude we can distinguish two aspects. 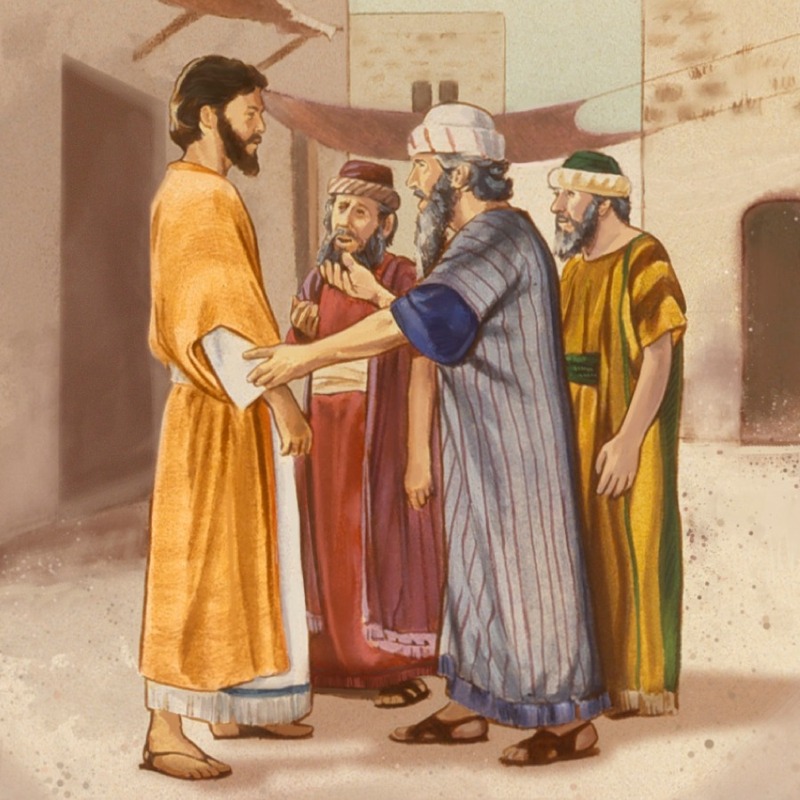 Firstly, his respect toward Jesus: he does not go to him, but sends some elders of the Jews; when he learns that Jesus is coming to his home, he sends some friends to tell him not to trouble himself. He expresses this respect saying: “I am not worthy to have you enter under my roof.” We could dismiss this attitude as a habit of ancient times, which could never inspire our relationship with God. Nowadays we are accustomed to repeat that we can approach God with confidence; we should not be afraid of him. And yet the Church puts these words into our mouth before we approach Holy Communion: “Lord, I am not worthy that you should enter under my roof…” Which means that this is the right attitude we should have toward God. Those words exactly describe our real condition: we are unworthy of getting in touch with God. It is the attitude once called “fear of God.” In today’s Church nobody talks any more of the fear of God; and yet it is so important. Of course, we cannot stop there; but it is the first step: we put ourselves in the right position before God. Jesus does not praise the centurion for his respect, but for his faith. And this is the second aspect we should consider. Where do we find the centurion’s faith in today’s gospel? In what he adds soon afterward: “Say the word and let my servant be healed.” Not only does he believe that Jesus can heal his servant, but he is even convinced that for him, to do this, a word is enough. The centurion is a practical man, accustomed to give orders and to make himself respected. So, if for him is so easy to say just a word to get something, what can prevent Jesus from healing his servant? One word is enough. Jesus is not a physician: there is no need of a home visit nor of medicines. “Say the word and let my servant be healed.” Also these words we repeat before Holy Communion: “Lord, I am not worthy that you should enter under my roof, but only say the word and my soul shall be healed.” The illness of the centurion’s servant is a symbol of our spiritual sickness. Only Jesus, by just a word, can heal us. On this Sunday we start the reading of the letter of Saint Paul to the Galatians. The Galatians were pagans living in Asia Minor, who had been converted by Paul to Christianity. After their conversion, some “Judaizers” had come, who maintained that, to be saved, the faith in Christ was not sufficient; there was need of the Jewish law with all its observances. The Apostle rejects this “new” gospel; there is only one gospel: what saves us is the faith in Christ; the Jewish law is totally useless. Whoever announces a different gospel is accursed. Paul warns us against a recurring temptation for Christians: to go with the times, to adjust to the common mentality, to try to please people. If we do this, we break our commitment. Our only point of reference should be Christ, not the world. We belong to Christ; we should try to please him alone, because only in him we can find salvation. The Holy Eucharist, which today’s solemnity wants to celebrate, is a very rich sacrament. The readings we have just heard illustrate some aspects of this wonderful mystery. The first reading emphasizes the sacrificial dimension of the Eucharist. Melchizedek, who was a priest of God Most High, offers bread and wine, prefiguring what Jesus will do during the last supper. 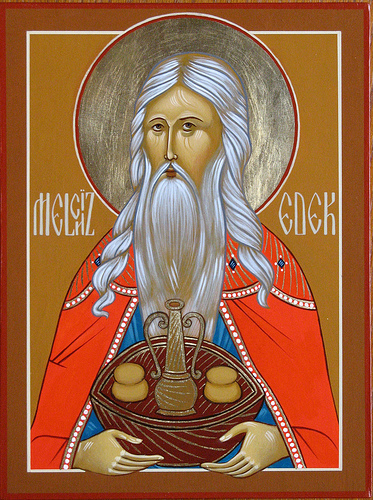 In the first Eucharistic Prayer we ask the Lord to accept the holy sacrifice of the Mass as once he accepted “the offering of [his] high priest Melchizedek.” The Eucharist is a real sacrifice, in which Jesus offers himself to the Father for the salvation of the world. The Mass is the bloodless renewal of the sacrifice of the cross. This sacrifice is represented not by the immolation of an animal, like in the Old Covenant, but by the offering of bread and wine, as Jesus did in the last supper and as, before him, Melchizedek had done. The second reading reminds us of another aspect of the Eucharist. 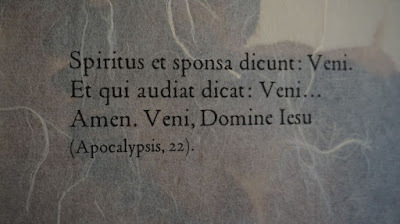 The passage from the first letter to the Corinthians is the most ancient account of the institution of the Eucharist. Jesus repeats: “Do this in remembrance of me.” At the end he explains the meaning of his words: “As often as you eat this bread and drink this cup, you proclaim the death of the Lord until he comes.” That is what we mean when we say that the Eucharist is the memorial of the Lord’s passion and resurrection. When we celebrate the Mass we remember the passion and the resurrection of Jesus; but it is not just the recollection of past events; it is as if they were present and real. Finally, the gospel presents the Eucharist as food. The multiplication of the loaves has always been considered as an image of the Eucharist. The gestures Jesus does on that occasion are the same as in the last supper. Jesus multiplies the loaves to feed hungry people; and he institutes the Eucharist to give them a spiritual food, without which it is impossible to live. The Eucharist is the true multiplication of the loaves: for two thousand years the Eucharistic bread has been multiplied through the words of priests, so that each one, in every time and in every place (even in Afghanistan), may be fed with that divine bread and find eternal life. Nowadays it is fashionable to say that the followers of the three great monotheistic religions—Judaism, Christianity and Islam—believe in the same God. Of course, we cannot say that they believe in three different gods, because there is only one God. But can we state that the God, in whom we believe, is simply the same? Can we maintain that the differences among the three religions are minor and just regarding details, without concerning our faith in God? The differences among the three monotheistic religions are radical: they do not regard only the figure, central for us, of Jesus Christ; but the very notion of God. We believe, like Jews and Muslims, in one God; but, unlike them, we believe that this God is in three Persons, the Father and the Son and the Holy Spirit. How can we say this? Is it just the result of our reasoning? No; it is God that has revealed himself to us. Of course, it was a gradual revelation. God first showed his oneness: in a pagan world, where all peoples believed in several deities, there was need of proclaiming the existence of only one God, Creator of heaven and earth. God started this revelation with Abraham. Then, little by little, he unveiled some aspects of his mystery. Today’s first reading, taken from the Old Testament book of Proverbs, is about the wisdom of God: it is not yet the full revelation of the second Person of the Holy Trinity, but it is a first step. Wisdom was set up before the beginning of the earth. When God created the world, Wisdom was with him like a craftsman. The evangelist John, who calls the second Person of the Trinity “Word”, at the beginning of his gospel says: “All things came to be through him, and without him nothing came to be” (Jn 1:3). It was not easy for Christians to penetrate this mystery. 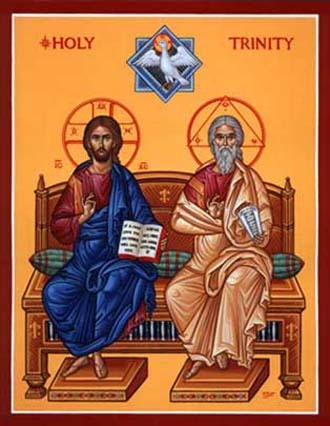 It took some centuries to succeed in defining the dogma of the Holy Trinity: there was need of the first two Councils (Nicaea and Constantinople); and before, during and after them, there were a lot of discussions, fights, heresies about the words to use: nature, substance, person. Now we know how to speak about this mystery: every Sunday we renew our profession of faith with the words of these Councils; and we know that we are not wrong. But we also know that what we say is nothing in comparison with the infinite mystery of God, a mystery of love: the Father loves the Son, and the Son returns this love; and this mutual love is not just a feeling, like in human relationships, but a person, the Holy Spirit. We can barely sense the depth of this mystery; and yet we are called to take part in it. God invites us to join his family, to become his children, like his Son; and to do this, he has given us his Spirit, the Spirit of adoption. Saint Peter says that we are called to share in the divine nature, exactly like the three divine Persons. We are confused in front of so great condescension. The only thing we can do is to adore, thank and strive to be worthy of such a gift. Glory be to the Father, and to the Son, and to the Holy Spirit. O blessed Trinity! Amen. During the last supper—we have heard it from the gospel—Jesus promises the coming of the Holy Spirit. He calls him the “Advocate”—“another Advocate,” because the first Advocate is Jesus himself. He will remain with the disciples for ever; he will teach them everything and remind them of all that Jesus has told them. Who is this mysterious figure? The disciples will understand it little by little, precisely with the assistance of the Holy Spirit himself. He is God, like the Father and like Jesus. They are three; not three Gods, but only one God in three Persons—a mystery that we will contemplate next Sunday, the mystery of the Most Holy Trinity. Through these words of the Acts of the Apostles we can understand something more about the Holy Spirit. He arrives like a wind. Both in Hebrew and in Greek the word for “wind” and “Spirit” is the same; which means that the Holy Spirit is really like wind: you do not see it, but you can feel it; sometimes the wind is so strong that it can uproot a tree. Likewise, the Holy Spirit can be compared to breath: even in this case, you cannot see breath, but you know how important it is for you, because it allows you to live. When you breathe your last, you are dead. Often in the gospel the Holy Spirit is also compared with water. Water is, among the natural elements, the most necessary for living: you can endure a long time without eating; but you cannot without water. That is why, in the Creed, we call the Holy Spirit the “giver of life.” On the contrary, the Acts of the Apostles tells us that “there appeared to them tongues as of fire, which parted and came to rest on each one of them.” So the Holy Spirit is like fire. Fire can firstly be used to purify. Usually, to wash we use water; but not everything can be cleaned by water; if you have to purify a noble metal, you have to put it in the furnace, so that the impurities may be separated from the metal. In the same way, the Holy Spirit purifies us from sin and makes us holy, like him. Moreover, fire is usually compared with love, because love warms hearts: when one is unable to love, we say that he is cold. Well, the Holy Spirit is the fire that kindles our hearts and enables them to love, not so much with a human love, but with a divine love. Yes, he can do this, because he is Love personified: he is the love that joins the Father and the Son; and he is not just a feeling, but a Person. When the Holy Spirit came down on the apostles, they began to speak in different tongues and the people present in Jerusalem, coming from different countries, were able to understand them. This is the first miracle of the Holy Spirit: he removes the divisions among men caused by sin, and makes of all humanity only one people. It is the mystery of the Church, that we are experiencing in this moment: we are from every part of the world, but with the same faith; we speak different languages, and yet we understand each other, because we are only one people, the people of God. But the greatest miracle of the Holy Spirit is that of which Saint Paul reminds us in the second reading: “You did not receive a spirit of slavery to fall back into fear, but you received a spirit of adoption, through which we cry, ‘Abba, Father!’ The Spirit itself bears witness with our spirit that we are children of God.” No more slaves, but children, children of God! Thanks be to God! 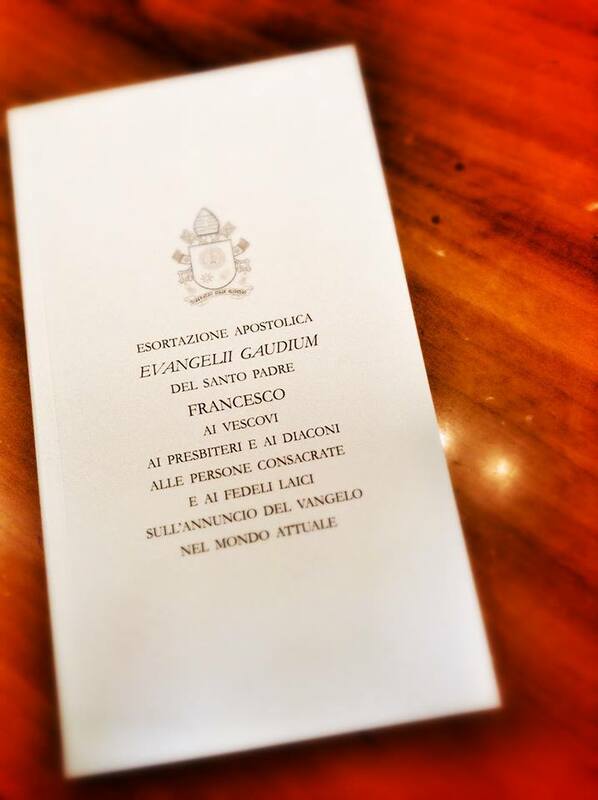 Nel mio post del 27 aprile 2016 sull’esortazione apostolica Evangelii gaudium (d’ora in poi, EG), al § 11, rimandavo «a un successivo intervento una riflessione sui “quattro principi relazionati a tensioni bipolari proprie di ogni realtà sociale” (n. 221), di cui si tratta nel quarto capitolo (nn. 222-237) e che possono essere in qualche modo considerati come i “postulati” del pensiero bergogliano». Penso che si tratti di una riflessione necessaria, dal momento che tali principi, oltre a risultare ricorrenti nell’insegnamento di Papa Francesco, vengono presentati come criteri generali di interpretazione e valutazione. Tali principi sono: a) il tempo è superiore allo spazio; b) l’unità prevale sul conflitto; c) la realtà è piú importante dell’idea; d) il tutto è superiore alla parte. 1. Principi, assiomi o postulati? EG 221, come abbiamo appena visto, li chiama “principi”, aggiungendo che «derivano dai grandi postulati della Dottrina Sociale della Chiesa». Affronterò piú avanti il problema della derivazione di tali principi; qui mi limiterò a notare che quelli che EG chiama “grandi postulati della Dottrina Sociale della Chiesa” sono in realtà sempre stati denominati “principi” (si veda, p. es, il capitolo quarto del Compendio della dottrina sociale della Chiesa). Alcuni preferiscono usare per i quattro principi di EG il termine “assiomi”. Ora un “assioma” è «un principio generale evidente e indimostrabile che può fare da premessa a un ragionamento, una teoria e sim.» (Zingarelli), definizione che non mi sembra si attagli ai quattro principi in questione. Personalmente ritengo che essi possano essere invece considerati “postulati” (secondo lo Zingarelli, il postulato è una «proposizione priva di evidenza e non dimostrata ma ammessa ugualmente come vera in quanto necessaria per fondare un procedimento o una dimostrazione»). La designazione di tali principi come “postulati” non può essere ritenuta arbitraria, dal momento che trova riscontro nella stessa EG: «è necessario postulare un principio» (n. 228); «occorre postulare un terzo principio» (n. 231). «I principi permanenti della dottrina sociale della Chiesa costituiscono i veri e propri cardini dell’insegnamento sociale cattolico: si tratta del principi della dignità della persona umana … nel quale ogni altro principio e contenuto della dottrina sociale trova fondamento, del bene comune, della sussidiarietà e della solidarietà» (n. 160). Nella successiva trattazione il Compendio aggiunge altri due principi strettamente connessi con i quattro appena enunciati (il principio della destinazione universale dei beni e quello di partecipazione), oltre a una serie di “valori fondamentali della vita sociale” (verità, libertà, giustizia, amore). Ebbene, si fa fatica a cogliere la derivazione dei quattro postulati di EG dai suddetti “principi permanenti della dottrina sociale della Chiesa”. O, perlomeno, tale derivazione non è cosí evidente; occorrerebbe metterla in luce e non darla per scontata. «Per crescere come cittadini occorre elaborare, alla confluenza delle categorie logiche di società e mitiche di popolo, questi quattro principi: il tempo è superiore allo spazio, l’unità è superiore al conflitto, la realtà è superiore all’idea, e il tutto è superiore alla parte» (Jorge Mario Bergoglio, Noi come cittadini. Noi come popolo, LEV-Jaca Book, Milano 2013, p. 68). Nella recensione di questo volume per l’Osservatorio Internazionale Cardinale Van Thuân Giuseppe Brienza afferma che «nel discorso di Buenos Aires il Papa esponeva per la prima volta quelle quattro prospettive nuove a partire dalle quali ripensare l’insieme delle relazioni sociali che pure ritroveremo nella “Evangelii Gaudium”». In realtà, la testimonianza personale del gesuita argentino Juan Carlos Scannone ci informa che «quando Bergoglio era provinciale, nel 1974, già li [= i quattro principi] usava. Io facevo parte con lui della Congregazione provinciale e l’ho ascoltato richiamarli per illuminare diverse situazioni che si trattavano in quel consesso». Si tenga presente che nel 1974 Bergoglio aveva 38 anni, era gesuita da sedici anni (1958), si era laureato in filosofia da una decina d’anni (1963), era sacerdote da cinque anni (1969) e Provinciale da uno (1973-1979), e non era ancora stato in Germania (1986) per completare i suoi studi. Sembrerebbe quindi di poter concludere che quei quattro principi siano il risultato delle riflessioni personali del giovane Jorge Mario Bergoglio. «Per avanzare in questa costruzione di un popolo in pace, giustizia e fraternità, vi sono quattro principi relazionati a tensioni bipolari proprie di ogni realtà sociale. Derivano dai grandi postulati della Dottrina Sociale della Chiesa, i quali costituiscono “il primo e fondamentale parametro di riferimento per l’interpretazione e la valutazione dei fenomeni sociali” [Compendio della dottrina sociale della Chiesa, n. 161]. Alla luce di essi desidero ora proporre questi quattro principi che orientano specificamente lo sviluppo della convivenza sociale e la costruzione di un popolo in cui le differenze si armonizzino all’interno di un progetto comune. Lo faccio nella convinzione che la loro applicazione può rappresentare un’autentica via verso la pace all’interno di ciascuna nazione e nel mondo intero» (n. 221). «Questo principio permette di lavorare a lunga scadenza, senza l’ossessione dei risultati immediati. Aiuta a sopportare con pazienza situazioni difficili e avverse, o i cambiamenti dei piani che il dinamismo della realtà impone. È un invito ad assumere la tensione tra pienezza e limite, assegnando priorità al tempo. Uno dei peccati che a volte si riscontrano nell’attività socio-politica consiste nel privilegiare gli spazi di potere al posto dei tempi dei processi. Dare priorità allo spazio porta a diventar matti per risolvere tutto nel momento presente, per tentare di prendere possesso di tutti gli spazi di potere e di autoaffermazione. Significa cristallizzare i processi e pretendere di fermarli. Dare priorità al tempo significa occuparsi di iniziare processi piú che di possedere spazi. Il tempo ordina gli spazi, li illumina e li trasforma in anelli di una catena in costante crescita, senza retromarce. Si tratta di privilegiare le azioni che generano nuovi dinamismi nella società e coinvolgono altre persone e gruppi che le porteranno avanti, finché fruttifichino in importanti avvenimenti storici. Senza ansietà, però con convinzioni chiare e tenaci» (n. 223). «Ricordando che il tempo è superiore allo spazio, desidero ribadire che non tutte le discussioni dottrinali, morali o pastorali devono essere risolte con interventi del magistero. Naturalmente, nella Chiesa è necessaria una unità di dottrina e di prassi, ma ciò non impedisce che esistano diversi modi di interpretare alcuni aspetti della dottrina o alcune conseguenze che da essa derivano. Questo succederà fino a quando lo Spirito ci farà giungere alla verità completa (cf Gv 16:13), cioè quando ci introdurrà perfettamente nel mistero di Cristo e potremo vedere tutto con il suo sguardo. Inoltre, in ogni paese o regione si possono cercare soluzioni piú inculturate, attente alle tradizioni e alle sfide locali...» (n. 3). Dobbiamo sinceramente riconoscere che la derivazione di tale conclusione dal principio in esame non è cosí immediata ed evidente come il testo sembrerebbe supporre. Parrebbe di capire che l’essenza del primo postulato stia nel fatto che non si debba pretendere di uniformare tutto e tutti, ma lasciare che ciascuno percorra la propria strada verso un “orizzonte” (nn. 222 & 225) che rimane, onestamente, piuttosto indefinito. «Dio si manifesta in una rivelazione storica, nel tempo. Il tempo inizia i processi, lo spazio li cristallizza. Dio si trova nel tempo, nei processi in corso. Non bisogna privilegiare gli spazi di potere rispetto ai tempi, anche lunghi, dei processi. Noi dobbiamo avviare processi, piú che occupare spazi. Dio si manifesta nel tempo ed è presente nei processi della storia. Questo fa privilegiare le azioni che generano dinamiche nuove. E richiede pazienza, attesa» (p. 468). Sulla rivista della Pontificia Accademia Teologica PATH (n. 2/2014, pp. 403-412) Don Giulio Maspero individua le fonti del principio in Sant’Ignazio e in Giovanni XXIII, citati da Papa Francesco nell’intervista a Padre Spadaro (pp. 406-408) e nel Beato Pietro Fabro, citato in EG 171 (p. 411); mentre esclude come fonte Romano Guardini, egli pure citato in EG 224 (p. 410). Al principio viene riconosciuta «una profonda radice trinitaria» (p. 410). La chiave ermeneutica del principio, di natura prettamente teologica, viene rinvenuta nell’affermazione della presenza e della manifestazione di Dio nella storia (p. 411). Francamente, si fa un po’ di fatica a seguire il ragionamento di Don Maspero in questo appassionato commento del principio della superiorità del tempo rispetto allo spazio. Personalmente, anziché le radici teologiche — che rimangono tutte da dimostrare — non posso non avvertire alla base del primo postulato alcuni filoni della filosofia idealistica, come lo storicismo, il primato del divenire sull’essere, la scaturigine dell’essere dall’azione (esse sequitur operari), ecc. Ma è un discorso che andrebbe approfondito dagli esperti in sede scientifica. «Il conflitto non può essere ignorato o dissimulato. Dev’essere accettato. Ma se rimaniamo intrappolati in esso, perdiamo la prospettiva, gli orizzonti si limitano e la realtà stessa resta frammentata. Quando ci fermiamo nella congiuntura conflittuale, perdiamo il senso dell’unità profonda della realtà. Di fronte al conflitto, alcuni semplicemente lo guardano e vanno avanti come se nulla fosse, se ne lavano le mani per poter continuare con la loro vita. Altri entrano nel conflitto in modo tale che ne rimangono prigionieri, perdono l’orizzonte, proiettano sulle istituzioni le proprie confusioni e insoddisfazioni e cosí l’unità diventa impossibile. Vi è però un terzo modo, il piú adeguato, di porsi di fronte al conflitto. È accettare di sopportare il conflitto, risolverlo e trasformarlo in un anello di collegamento di un nuovo processo» (nn. 226-227). Questo terzo atteggiamento nei confronti del conflitto si basa sul principio «indispensabile per costruire l’amicizia sociale: l’unità è superiore al conflitto» (n. 228). Tale principio ispira il concetto di “diversità riconciliata” (n. 230), ricorrente nell’insegnamento di Papa Francesco, soprattutto in campo ecumenico. «La solidarietà, intesa nel suo significato piú profondo e di sfida, diventa cosí uno stile di costruzione della storia, un ambito vitale dove i conflitti, le tensioni e gli opposti possono raggiungere una pluriforme unità che genera nuova vita. Non significa puntare al sincretismo, né all’assorbimento di uno nell’altro, ma alla risoluzione su di un piano superiore che conserva in sé le preziose potenzialità delle polarità in contrasto» (n. 228; sottolineatura mia). Quella “risoluzione su di un piano superiore” richiama tanto l’Aufhebung hegeliana. Non sembra poi casuale che, al n. 230, si parli di una “sintesi”, che evidentemente presuppone una “tesi” e un’“antitesi” (i poli in conflitto tra loro). Anche in questo caso il discorso andrebbe approfondito. «Esiste anche una tensione bipolare tra l’idea e la realtà. La realtà semplicemente è, l’idea si elabora. Tra le due si deve instaurare un dialogo costante, evitando che l’idea finisca per separarsi dalla realtà. È pericoloso vivere nel regno della sola parola, dell’immagine, del sofisma. Da qui si desume che occorre postulare un terzo principio: la realtà è superiore all’idea. 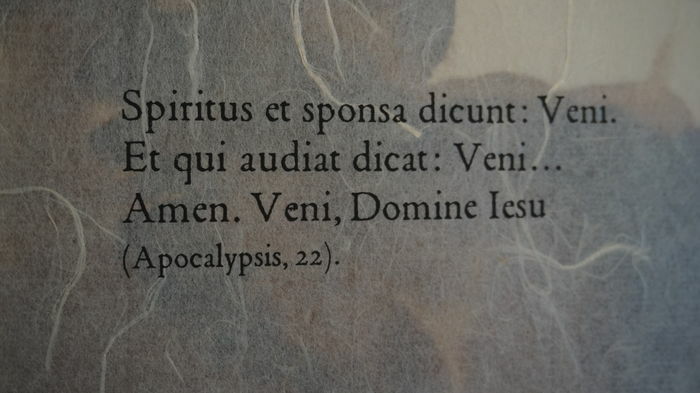 Questo implica di evitare diverse forme di occultamento della realtà: i purismi angelicati, i totalitarismi del relativo, i nominalismi dichiarazionisti, i progetti piú formali che reali, i fondamentalismi antistorici, gli eticismi senza bontà, gli intellettualismi senza saggezza» (EG 231). «L’idea — le elaborazioni concettuali — è in funzione del cogliere, comprendere e dirigere la realtà. L’idea staccata dalla realtà origina idealismi e nominalismi inefficaci, che al massimo classificano o definiscono, ma non coinvolgono. Ciò che coinvolge è la realtà illuminata dal ragionamento. Bisogna passare dal nominalismo formale all’oggettività armoniosa. Diversamente si manipola la verità, cosí come si sostituisce la ginnastica con la cosmesi [Platone, Gorgia, 465]» (n. 232). b) del linguaggio utilizzato, che non è un linguaggio tecnico. Quando si parla di “idealismi e nominalismi inefficaci” non ci si sta riferendo alle correnti storiche dell’idealismo e del nominalismo (tanto è vero che si usa il plurale). Soprattutto, i termini “idea” e “realtà” sono intesi in un significato diverso da quello in cui potrebbe intenderli la gnoseologia tradizionale: la “realtà” di cui si parla in EG non è la realtà metafisica (cioè sinonimo di “essere”), ma una realtà puramente fenomenica; l’“idea” non è la semplice rappresentazione mentale dell’oggetto, ma, come il testo stesso indica, è sinonimo di “elaborazioni concettuali” (n. 232), e quindi di “ideologia”. D’altra parte, l’uso di espressioni “esistenziali” (come, p. es., il verbo “coinvolgere”) avrebbe dovuto far capire immediatamente che non si trattava del linguaggio scolastico tradizionale. «Se il cristiano è restaurazionista, legalista, se vuole tutto chiaro e sicuro, allora non trova niente. La tradizione e la memoria del passato devono aiutarci ad avere il coraggio di aprire nuovi spazi a Dio. Chi oggi cerca sempre soluzioni disciplinari, chi tende in maniera esagerata alla “sicurezza” dottrinale, chi cerca ostinatamente di recuperare il passato perduto, ha una visione statica e involutiva. E in questo modo la fede diventa una ideologia tra le tante» (pp. 469-470; corsivo mio). «Il tutto è piú della parte, ed è anche piú della loro semplice somma. Dunque, non si dev’essere troppo ossessionati da questioni limitate e particolari. Bisogna sempre allargare lo sguardo per riconoscere un bene piú grande che porterà benefici a tutti noi. Però occorre farlo senza evadere, senza sradicamenti. È necessario affondare le radici nella terra fertile e nella storia del proprio luogo, che è un dono di Dio. Si lavora nel piccolo, con ciò che è vicino, però con una prospettiva piú ampia. Allo stesso modo, una persona che conserva la sua personale peculiarità e non nasconde la sua identità, quando si integra cordialmente in una comunità, non si annulla ma riceve sempre nuovi stimoli per il proprio sviluppo. Non è né la sfera globale che annulla, né la parzialità isolata che rende sterili» (EG 235). Va apprezzato tale tentativo di tenere insieme i due poli, che sono in tensione tra loro — il tutto e la parte — e che in EG vengono identificati con la “globalizzazione” e la “localizzazione” (n. 234). La valorizzazione della parte, che non deve scomparire nel tutto, viene rappresentata dalla figura geometrica, cara a Papa Francesco, del poliedro, in contrapposizione alla sfera (n. 236). Il problema è che il principio, cosí com’è formulato, non esprime tale equilibrio tra il tutto e le parti; esso parla apertamente di superiorità del tutto rispetto alle parti. E questo è in contrasto con la dottrina sociale della Chiesa, la quale dichiara, sí, la persona un essere costitutivamente sociale, ma allo stesso tempo ne riafferma il primato e l’irriducibilità all’organismo sociale (Compendio della dottrina sociale della Chiesa, nn. 125 e 149; Catechismo della Chiesa cattolica, nn. 1878-1885). C’è il rischio che, limitandosi a ripetere il quarto postulato senza ulteriori precisazioni, esso possa essere inteso in senso marxista e giustificare cosí l’annullamento dell’individuo nella società. Si tenga presente che, anche da un punto di vista ermeneutico, il rapporto tra il tutto e le parti non viene descritto in termini di superiorità ma di circolarità (il cosiddetto “circolo ermeneutico”: il tutto va interpretato alla luce della parti; le parti, alla luce del tutto). Che, nella realtà in cui ci troviamo a vivere, esistano delle polarità, è un fatto difficilmente controvertibile. Ciò che conta è l’atteggiamento che assumiamo di fronte alle tensioni che sperimentiamo quotidianamente nella nostra vita. Una descrizione dei diversi atteggiamenti possibili di fronte al conflitto la troviamo, come abbiamo visto, in EG 227 (vedi sopra, § 5). Dalla considerazione dei quattro postulati nel loro insieme sembrerebbe di dover concludere che l’atteggiamento piú consono sia quello di comporre, sí, i poli che si oppongono, ma presupponendo che uno dei due sia superiore all’altro: il tempo è superiore allo spazio; l’unità prevale sul conflitto; la realtà è piú importante dell’idea; il tutto è superiore alla parte. Personalmente ho sempre ritenuto che le tensioni vadano piuttosto “gestite”; che sia utopistico pensare che esse possano essere, finché siamo su questa terra, definitivamente superate; che, oltre tutto, sia sbagliato parteggiare per uno dei due poli contro l’altro, quasi che il bene sia solo da una parte e dall’altra ci sia solo male (una visione manichea della realtà sempre rifiutata dalla Chiesa). Il cristiano non è l’uomo dell’aut aut, ma dell’et et. In questo mondo c’è — deve esserci! — spazio per tutto: per il tempo e per lo spazio, per l’unità e per le diversità, per la realtà e per le idee, per il tutto e per le parti. Nulla va escluso, pena lo squilibrio della realtà, che può portare a conflitti devastanti. Un’altra osservazione che si potrebbe fare al termine di questa riflessione è che l’esposizione di questi quattro postulati dimostra che, nell’agire umano, è inevitabile lasciarsi condurre da alcuni principi, che per loro natura sono astratti. A nulla serve quindi polemizzare sull’astrattezza della “dottrina”, opponendole una “realtà” a cui ci si dovrebbe semplicemente adeguare. La realtà, se non è illuminata, guidata, ordinata da alcuni principi, rischia di risolversi in caos. Il problema è: quali principi? Sinceramente non si vede perché i quattro postulati di cui ci siamo occupati possano legittimamente orientare lo sviluppo della convivenza sociale e la costruzione di un popolo, mentre la medesima legittimità non possa essere riconosciuta ad altri principi, a cui viene continuamente rinfacciata la loro astrattezza e il loro carattere, almeno potenzialmente, ideologico. Che la dottrina cristiana corra il rischio di trasformarsi in ideologia, non lo si può negare. Ma lo stesso rischio viene corso da qualsiasi altro principio, compresi i quattro postulati di EG; con la differenza che questi sono il risultato di una riflessione umana, mentre la dottrina cattolica si fonda su una rivelazione divina. Che non avvenga a noi oggi ciò che è accaduto a Marx, il quale, mentre tacciava di ideologia i pensatori che lo avevano preceduto, non si accorse che stava elaborando una delle ideologie piú rovinose della storia. This is the next to last Sunday of Eastertide; next week we will celebrate the solemnity of Pentecost, whereby the liturgical paschal season comes to an end. 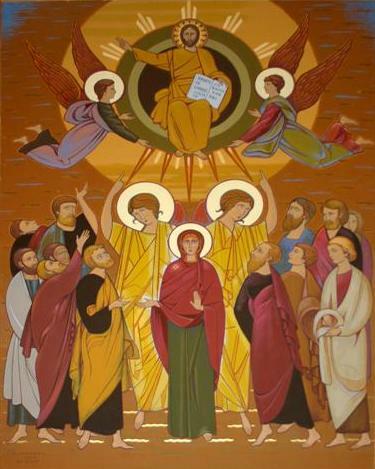 This Sunday falls within the ten days between the ascension of the Lord and the descent of the Holy Spirit. We are still contemplating Jesus taken up to heaven and already waiting for the fulfillment of his promise to send us the gift of the Holy Spirit. The first reading is somehow related to the mystery of the ascension. Stephen during his trial says: “Behold, I see the heavens opened and the Son of Man standing at the right hand of God.” He practically affirms to the Sanhedrin that the prophecy Jesus made before them has been fulfilled. For the Jews this is a blasphemy. If you remember, when Jesus told this during his trial, the High priest tore his garments; now they cry out in a loud voice, throw him away and stone him to death. Stating that Jesus is at the right hand of God means to recognize him as God, to make of a man God. Which is intolerable for the Jews; the core of the Christian faith for us. The second reading is the conclusion of the book of Revelation. Even in this case there is a reference to the mystery of the ascension. When Jesus ascended into heaven, the angels said to the apostles: “This Jesus who has been taken up from you into heaven will return in the same way as you have seen him going into heaven.” In the Creed we profess our faith in Jesus, who “will come again in glory to judge the living and the dead.” Well, at the end of Revelation Jesus assures us that his return is imminent: “Behold, I am coming soon. I will bring with me the recompense I will give to each according to his deeds.” Jesus introduces himself with all his titles of rank: “the Alpha and the Omega,” “the first and the last,” “the beginning and the end,” “the root and offspring of David,” “the bright morning star.” The Spirit and the bride, that is, the Church, answer him: “Come.” And we also are invited to join the same prayer: Come, Lord Jesus! Marana tha was the prayer of the early Christians, who really were waiting for the second coming of the Lord. The gospel reports the last part of the long discourse of Jesus during the last supper. Jesus concludes his farewell speech with a prayer: it is usually known as the “high priestly prayer.” Jesus is not speaking any more to his disciples; his words are addressed directly to the Father; he is playing the role of the intercessor, the high priest who prays for his disciples. After praying for the disciples at that time, Jesus at the end of his prayer prays for his future disciples: “Holy Father, I pray not only for them, but also for those who will believe in me through their word.” We are these ones. What does Jesus ask for us? Unity with him and among us: “That they may all be one, as you, Father, are in me and I in you, that they also may be in us.” It is interesting to notice that this unity is considered by Jesus the way to convert others to him: “That the world may believe that you sent me.” People will not be converted by our words, but only by our witness of unity. Mind you, this unity is not the result of our human efforts; it is a gift of God; that is why Jesus is praying for it. Before ending, I would like to stress another text of today’s liturgy, that I find very meaningful: the verse before the gospel. It is taken also from the farewell discourse of Jesus during the last supper, but from a previous chapter. Jesus says: “I will not leave you orphans. 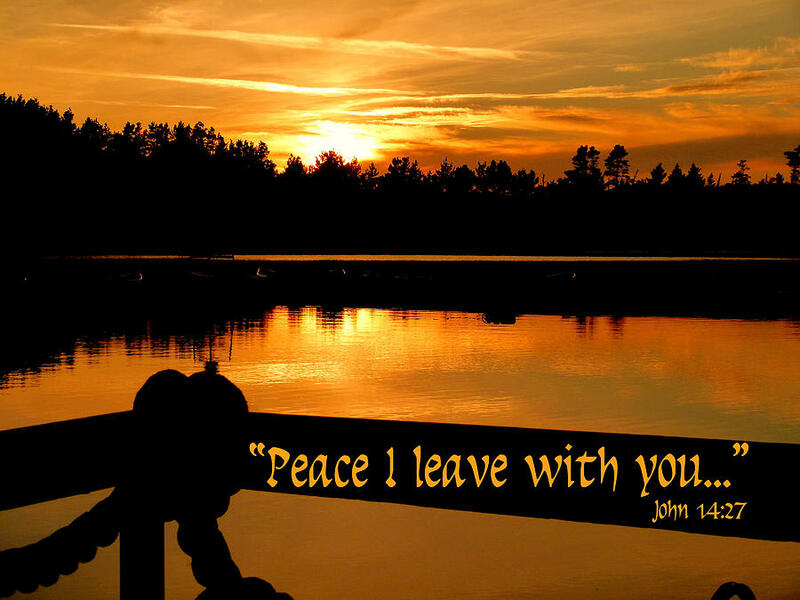 I will come back to you, and your hearts will rejoice.” I think, in these words of Jesus, we should find our peace: we are not alone, Jesus is with us; he will come back soon, we should await him with joy and pray: Come, Lord Jesus! We have heard in the first reading the beginning of the Acts of the Apostles and in the third reading the conclusion of the gospel of Luke. These two books of the New Testament were written by the same author, the evangelist Luke; they constitute, as it were, only one work: the gospel narrates the earthly life of Jesus; the Acts of the Apostles deals with the mission of the Church, that is a different way for Jesus to be present in the world. The hinge that connects the two books is exactly the ascension of Jesus: this event closes the gospel and opens the Acts. Even the instructions that Jesus gives to his disciples before leaving them are similar: he first renews the promise of the Holy Spirit, and then he invites them to be his witnesses in the world. The two things are closely related: the disciples will be witnesses of Jesus precisely because they will receive the Holy Spirit; it is the Holy Spirit that will enable them to bear witness to Christ. But there is a discrepancy between the gospel and the Acts. At the end of the gospel it seems that the ascension happens on the night of the very day of the resurrection; instead, in the Acts this event takes place forty days after the resurrection. We can explain this discrepancy saying with the Catechism that the ascension is, at the same time, a historical and transcendent event (n. 660). In the gospel Luke emphasizes the transcendent aspect of the ascension, that is to say, he closely associates the ascension with the resurrection: they are two faces of the same mystery, namely, of the paschal mystery. The glorification of Jesus had already happened with his resurrection. Indeed, the second reading shows us that this glorification had already taken place in Jesus’ death. Jesus entered the sanctuary, that is, heaven when he shed his blood on the cross. At that moment he did what the high priest symbolically used to do once a year entering the Holy of Holies in the temple to take away the sins of the people. Passion, death, resurrection, ascension and outpouring of the Holy Spirit belong to the one paschal mystery. In the Acts of the Apostles, instead, Luke historicizes the ascension, that is to say, he tells us what really happened from the historical point of view: after his resurrection, Jesus appeared to his disciples for forty days. It was necessary to do this, so that they might become convinced of the resurrection. They had not only to believe that Jesus was alive, but also that from then on he would be with them in a different way. Actually, when Jesus left them, the disciples were not sad. The gospel says that they “returned to Jerusalem with great joy, and they were continually in the temple praising God.” By then, they knew that Jesus was with them, even if they did not see him any more. There is no need of seeing Jesus, when you know that he is with you. Just as Jesus had not left the Father when he came down onto the earth, so now, going back to heaven, he does not leave his disciples alone in the world. By now he constitutes only one reality with them, the Church, which is his body: he is the head of the body and the disciples are its members. The head is now in heaven, seated at the right hand of the Father; the body is still on the earth, to continue his mission. The head has gone before into heaven, to prepare a place for his disciples; these will follow him. In the meantime, he uses them to continue his work in the world; through them he makes himself present among men. Staying at the right hand of the Father, as the high priest, he intercedes for them, he supports them in their journey, waiting for them to reach him. If Jesus is with us on earth, we have to be with him in heaven. If he, seated at the right hand of the Father, is waiting for us, we, still pilgrims on earth, should look forward to rejoining him in the heavenly homeland. On these last Sundays of Eastertide we read in the gospel some passages from the long discourse delivered by Jesus during the last supper with his disciples. This speech is a farewell discourse, a kind of spiritual testament, whereby Jesus expresses his last will to the apostles. Last week, if you remember, Jesus gave them the new commandment of brotherly love. Then he had told them that this commandment would be a kind of identification mark: “This is how all will know that you are my disciples, if you have love for one another.” Now he adds that keeping his word (that is, observing his commandment) is the way to show him our love: “Whoever loves me will keep my word … Whoever does not love me does not keep my words.” Ant that is the condition for us to be loved by God: “Whoever loves me will keep my word and my Father will love him.” At this point Jesus makes a surprising promise to his disciples: “We will come to him and make our dwelling with him.” Theologians have called this dwelling the “inhabitation of the Holy Trinity” within human soul. That is the essence of Christian life: today we emphasize so much our personal commitment—which is, of course, very important—but we often forget that, to be Christian, first of all there is need for God to dwell in us. We are talking of the “inhabitation of the Holy Trinity.” Up to now Jesus has referred to himself as the Son and has called God “the Father.” Now he introduces another mysterious figure: the Holy Spirit. He calls him “Advocate,” in Greek the “Paraclete,” a very rich term that can mean a defense attorney, a spokesman, a mediator, an intercessor, a comforter, a consoler. Here he is presented as a kind of teacher: “The Advocate, the Holy Spirit, whom the Father will send in my name, will teach you everything and remind you of all that I told you.” Meaning that, now that Jesus is leaving the world, the Holy Spirit will continue his mission on earth. Jesus’ mission is not yet accomplished: he taught his disciples, but they in most cases did not understand his words; so there is need of someone who reminds them of his teachings. In the first reading we see the Holy Spirit in action in the early Church. There is a new problem: even pagans have joined the new faith; some of the Jewish Christians would like them to be circumcised. According to them, without circumcision they cannot be saved. What to do? Jesus had said nothing about that; the first disciples were all Jews; so at the beginning there was no problem; but now the situation has changed; there is need to find a solution. 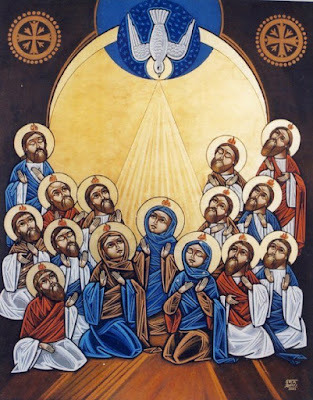 So they decide to convene a meeting of the apostles and elders, the so called “Council of Jerusalem.” They discuss among them; but they are not alone; there is with them the Holy Spirit. In fact, in the letter they send to Antioch at the end of the Council, they say: “It is the decision of the Holy Spirit and of us...” The Holy Spirit will accompany the journey of the Church through ages until today. Jesus does not limit himself to promise the Holy Spirit to his disciples; he leaves them a token of his love, a souvenir of his presence: “Peace I leave with you; my peace I give to you.” For the Jews peace was the fullness of life; it was the messianic gift par excellence; now that Jesus is concluding his mission, he gives this gift to his disciples: they will experience this peace in their lives. 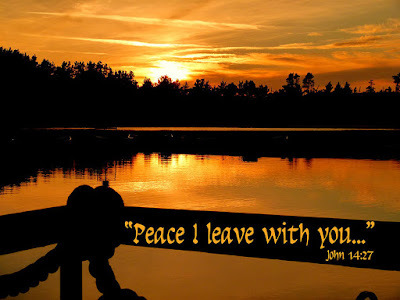 But, watch out, this peace does not coincide with the worldly peace: “Not as the world gives do I give it to you.” True peace is not fruit of human efforts; it is a gift from on high: we can find peace only in Christ. We can experience this peace right in the middle of hostilities: Jesus’ peace is not just lack of violence or conflicts; it is an inward peace that we can enjoy even on a battlefield. There is only one condition to experience all these things, faith: “I have told you this before it happens, so that when it happens you may believe.” Only believing we can be inhabited by the Holy Trinity; only believing we can receive the Holy Spirit; only believing we can enjoy true peace.